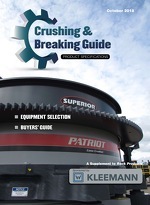 Telescoping conveyors and truck unloaders increase efficiencies when loading and unloading aggregate and mineral ores. A Customized Clarification System Eliminates a Costly Settling Pond and Pumps Fines To a Final Stockpiling Location. Change is inevitable. Sometimes it can be planned, and sometimes we’re unexpectedly thrown into the midst of it. A Kansas-Based Limestone Operation Realizes Cost-Effective Solutions In Synthetic Screen Media Vs. Woven Wire Cloth. Polaris Minerals reported sales of $18.8 million, a 36% decrease over sales of $29.6 million generated in the prior year for the year ended Dec. 31, 2009. U.S. Transportation Secretary Ray LaHood today appointed Leanna Depue, highway safety director for the Missouri department of transportation and Anthony Kane, director of engineering and technical services for the American Association of State Highway and Transportation Officials, to the 10-member Advisory Council on Transportation Statistics. Oldcastle donated $154,000 to CHF International, Hope for Haiti and the Canadian Red Cross. The funds were collected through a company-wide employee donation program with a 100% Oldcastle match. Regional Transportation Infrastructure Issues, the third conference it has held in conjunction with Iona College on the topic of infrastructure investment in the United States. Secretary of the Interior Ken Salazar said that the Department has added an additional $24.2 million to a previously awarded $8.8 million grant to the Louisiana Department of Natural Resources to reimburse construction costs for improvements to LA Highway 1. This state highway is essential for transporting offshore oil and gas supplies to and from Louisiana’s Port Fourchon. The House Transportation and Infrastructure Committee heard testimony last week about the importance of a long-term transportation bill. During the global economic crisis, HeidelbergCement program to reduce costs exceeded its original goals considerably and strengthened HeidelbergCement's resistance in the face of the crisis. The following is a formal position issued by the Industrial Minerals Association — North Amercia on the Mine Safety and Health Administration’s technical support incident reduction program. The Global Asphalt Pavement Alliance plans to issue a position statement on warm-mix asphalt and adopt a unifying tagline for use around the world. It also elected a new chairman. The alliance is comprised of multi-national and national asphalt pavement associations throughout the world. California’s $62 million Folsom Dam improvement project requires extensive rock excavation using a fleet of drills in an ever-changing formation—a situation that presents some very difficult drilling. The project has had as many as 16 drills on site at one time with an average of 11 drilling most days. Those rigs include the Atlas Copco ECM 585, ECM 590, ROC D7 and the newest Atlas Copco crawler, the ROC T35M. In total, an estimated 1 million yards of material will be drilled and shot when the project is complete. The Senate approved the Hiring Incentives to Restore Employment Act by a 68-to-29 vote on March 17. Among other things, the bill extends the surface transportation law until the end of the year and moves $19.5 billion into the highway trust fund to keep it solvent. Recent statistics show that construction output in the United Kingdom fell by more than 11% in 2009. Industry veteran and incoming Chairman of the National Stone, Sand & Gravel Association William Schneider is president and CEO of Knife River. He has steered his company to 11 straight years of declining injuries by building a corporate culture of safety. This Industry Market Research report provides a detailed analysis of the United States sand and gravel mining industry, including key growth trends, statistics, forecasts, the competitive environment including market shares and the key issues facing the industry. The contradiction that showed U.S. employment and unemployment both going up in January is one of several complex aspects of the labor market's road from recession to recovery, The Conference Board reports. U.S. construction equipment exports dropped more than 38% in 2009 compared to the previous year for a total $12.8 billion worth of machinery shipped to other nations, with declines of between nearly 30% to 50% for major world regions. The U.S. Environmental Protection Agency has named Cemex USA a 2010 Energy Star Partner of the Year for outstanding energy management and reductions in greenhouse gas emissions. Unable to reach agreement on Feb. 25 on the Senate long-term extension of the highway program, the House by voice vote passed a 30-day extension of several programs including the highway trust fund (HTF) at the low pro rata rate currently provided by the continuing resolution and sent it to the Senate. The Clean Water Council encourages inclusion of the Sustainable Water Infrastructure Investment Act (HR 537) in the latest jobs bill under consideration in the House of Representatives. The program was unveiled last month in a private meeting with selected mining groups and some operators and then at two regional meetings in West Virginia and Texas. It is a supplement to the mandatory enforcement provisions of the Mine Act although it is not 100% clear whether this will trigger additional inspection events beyond the usual “2s and 4s” (plus any additional inspections flowing from accidents or complaints). Trust is one of the casualties of the deteriorating relationship that exists today between mine operators and the Mine Safety and Health Administration. Industry veteran and incoming Chairman of the National Stone, Sand & Gravel Association William Schneider is president and CEO of Knife River. He has steered his company to 11 straight years of declining injuries by building a corporate culture of safety. Here’s how he did it. Earlier this month, Association of Equipment Manufacturers President Dennis Slater addressed the House Committee on Energy and Commerce's subcommittee on commerce, trade and consumer protection. The National Stone, Sand & Gravel Association held its 2009 elections for officers, executive committee members and two board vacancies on March 12 during the association's annual convention in Orlando. According to the Philippine newspaper The Freeman, mining companies spent at least P830 million ($17.3 million) in 2008 by mining companies in Central Visayas to comply with environmental requirements. The Fort Hills Energy L. P. reached an agreement with the government of Alberta, Canada to extend the term of the Fort Hills oil sands leases until 2019. The mine is located 90 kilometers north of Fort McMurray, Alberta. Barzin Mobasher, a professor in the department of civil, environmental and sustainable engineering, has been selected as a Fellow of the American Concrete Institute. Cemex has initiated discussions with its core banks to renegotiate the majority of its outstanding debt, or approximately $14.5 billion in syndicated and bilateral obligations. The U.S. Environmental Protection Agency (EPA) has proposed requiring businesses to report on their greenhouse gas emissions. As anticipated, the Obama Administration has frozen a Bush-era Endangered Species Act (ESA) regulation. Secretary Hilda Solis was confirmed as Secretary of Labor on February 24, 2009. The California Construction and Industrial Materials Association will host a series of Surface Mining and Reclamation Act (SMARA) Workshops during 2009. Drilling and blasting technology for aggregates continues to grow and further optimize feed material shape for faster throughput and better quality control. Take a look at the latest developments. The Obama administration's proposed fiscal 2010 budget for the U.S. Environmental Protection Agency seeks a 34 percent hike in funding for the agency. 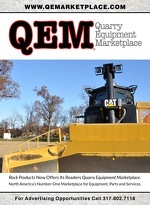 Because of the worldwide recession, QMJ Publishing Ltd. has decided to postpone the Hillhead show, originally scheduled for June 2009, for 12 months. How to monitor noise and dust exposure will be the topic of an April 21-23 safety and health workshop to be held at Luck Stone's Leesburg (Va.) quarry. 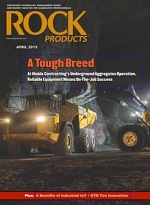 Rock Obama: What Will This Administration Do For The Aggregates Industry? For 53 years, Ron Kruse has been an employee of National Lime & Stone Company, a member of industry associations and an advocate of the aggregates industry. For the past 50 years Ron has been a vital part of his community while raising and supporting his family. Builder confidence in the market for new single-family homes remained unchanged in March, according to the latest NAHB/Wells Fargo Housing Market Index (HMI), released today. The HMI held firm at 20, which is near its historic low of 18 set in December of 2007 (the series began in January of 1985). The New York State Dept. of Labor is anticipating enacting legislation to change its present standards for explosives possession, handling, storage and transportation as outlined in Code Rule 39, last amended April l7, 1991. The closing of a stretch of Interstate 95 in Pennsylvania this week demonstrates once again the tremendous unmet transportation needs facing the country. Performance and reliability concerns extend beyond screening media. In the harsh operating environments in which vibrating screens are generally found, mechanical components often break, loosen or corrode. Schenck's Vibromac 100 and 200 vibration monitoring and controls systems also are designed to protect screens and similar gears. Several other suppliers offer similar screening media. Durex Products says its new Dur-X-LiveWire poly-wire slotted-wire screen media also eliminates blinding and plugging problems while delivering longer wear life. Metso Minerals' new Lokotrack ST458 mobile screening plant has been designed for improved reliability and productivity, according to the company. In a commodity-based business, the more time needed to convert resources into revenue generally results in reduced profits due to increased overhead. This is where machine efficiency enters the picture, and there's no more important aspect of this than screening efficiency.